Lo, I teach you the superman: he is this lightning, he is this madness! Michael Watts, Bowie profile in Melody Maker, 22 January 1972. Bowie, who never had the sunniest of dispositions, grew apocalyptic at the dawn of the 1970s. He knew what was coming: neo-fascism, nuclear war, authoritarian cults of personality, decadence, civilization’s end (he gave the human race 40 years to live, soon cut it down to five). 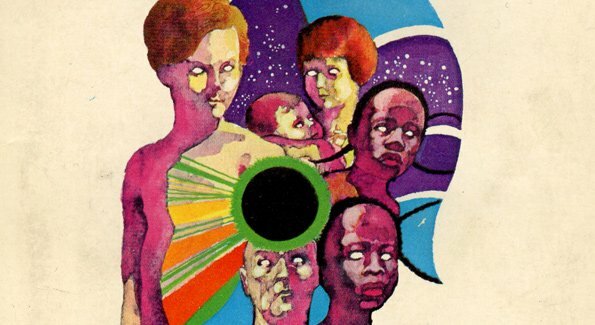 Worse, he had started reading Nietzsche, mainly Also Sprach Zarathustra and Beyond Good and Evil, and took from the former the concept of a new race of overmen who would supplant homo sapiens. For Bowie, this was cause for slight optimism. Even though he is immortal…mankind is affected by mortality…above the cosmic framework, he became a slave in it…He never sleeps because he comes from one who is sleepless. Yet love and sleep are his masters. Poimandres, the Shepherd of Men. Bowie’s supermen, however, are locked in the past, once-gods who became mortal. As the very Gnostic lyric says, they are “wondrous beings chained to life.” The song chronicles their fall: the chorus boasts that the perfect men cannot die, but then the overmen dream of murder and rotting flesh; in the last repeat of the chorus, Bowie alters the final word and releases his supermen into death. For the album cut, Bowie, Ronson and Visconti made, as Visconti later said, an “outrageous sonic landscape.” The track opens with a fanfare on echo-tracked drums, which, like the end of “Width of a Circle,” suggests the tympani of the first movement of Strauss’ “Also Sprach Zarathustra.” (This marks the debut of Woody Woodmansey, who Ronson brought in to replace John Cambridge on drums after Cambridge couldn’t master the song’s odd time signatures.) There’s a wordless, moaning chorus soaring throughout, while Ronson offers a solo constructed from three harmonized guitar tracks. Bowie, for whatever perverse reason, sings his lyric in an exaggerated, nasal, near-Cockney tone (“strAYnge gAYmes thAY would plAY then”), even gasping horribly while he sings “nightmAYre dreams no mortal mind could ‘OLD”. It causes the track to war between self-parody and stone-faced seriousness. Bowie re-recorded “The Supermen” in November 1971 during the Ziggy Stardust sessions, and gave the track to a compilation LP to benefit the Glastonbury Fair (causing at times the remake to be erroneously labeled as a live recording). The new arrangement suggests a rethink of the song, with the verses now only carried by Bowie’s acoustic guitar while Ronson comes in hard on the choruses. The band would use this arrangement in most of its 1972-1973 live performances (see the 1972 recording from Boston above). Bowie has occasionally exhumed his master race on a few recent tours. “The Supermen” was first recorded at a BBC session on 25 March 1970 (I’ve not heard it, but Nicholas Pegg writes that it’s close to the studio version, with a few slightly altered lyrics and Cambridge’s “dodgy” drumming); the studio track (sequenced as the final cut on the LP, and so ending the record with the death of gods) was recorded between 18 April-22 May 1970. The remake, recorded on 12 November 1971, was first included on Glastonbury Fayre and is now on the reissue of Ziggy Stardust; the Boston recording, from 1 October 1972, is on the 30th anniversary issue of Aladdin Sane. 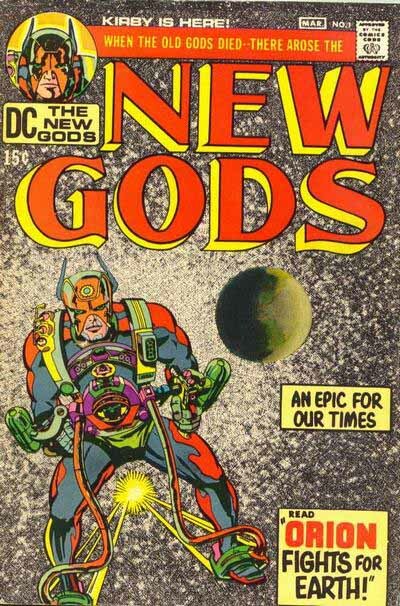 Top: Jack Kirby’s New Gods #1; detail from cover of Sturgeon’s More Than Human.